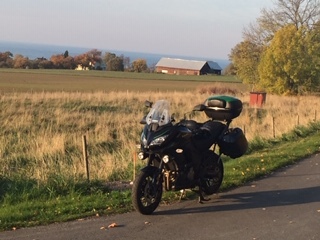 Hello from an ex pat in Sweden, picked up my new Versys 9th October, moved over from a Yamaha MT09 Tracer. Completely different characters Tracer a bit more nimble and somewhat "buzzy", the Versys very relaxing in comparison but still able to hustle when the opportunity arises. 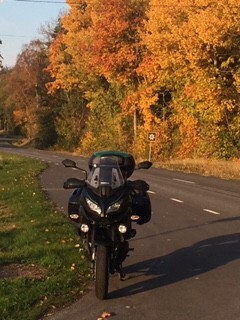 Redeye you are most welcome to this forum and also to Versys1000 ownership. Yes, welcome, Redeye. Happy miles to you. These Versys grow on you. They're terrific. Yes... neutral, easy handling, suspension good when properly adjusted, brakes well up to the normal mission for the bike. And the engine is great, being of reduced compression and tuned for low and midrange to give a flat power band... changes that leave a Ninja liter engine overbuilt and bulletproof and smooth as can be. Owners on this board have modded everything, with some success. But the basic package as provided is very well balanced and coordinated. You will enjoy months of realizing more and more what a great bike you have. After that, you won't take it for granted. You will appreciate it every time you ride. Welcome from West Wales Redeye, I too looked at the Tracer but really really like the Vk....its just so versatile...just like it says on the side. Hi Redeye and welcome! Not too freezy in Sweden at this time?